After a very successful and award winning Oregon St Tailgate, it was time to win some more awards. The planning for this tailgate went back a long way. 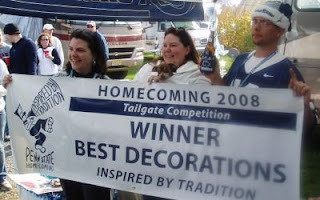 We won the BEST DECORATIONS catagory in the alumni tailgating competition. "Stick it to the Beavers"
The beginning of this great tailgate started with just an email. It was from an Oregon State Fan and said, "We have the airline tickets, the hotel tickets, we will have the game tickets, but the one thing we don't have is a place to tailgate. I have researched the Internet over and over and looked at numerous tailgating sites, but your group just stood out the most." During the spring and summer, we worked together to coordinate this massive, multi-day bash for the fans of both teams. I am pleased to announce that your entry has been selected as the winner of the Most Unusual Tailgating Display category in the Coleman/Camping World All Star Tailgate Team Photo Contest! You have won a Coleman Tailgating Kit consisting of a RoadTrip LXE Grill, Frywell Portable Fryer, Heat N' Serve Slow Cooker, 54 qt. Steel Belted Cooler and two Portable Deck Chairs, all by Coleman and valued at $700. A Coleman representative will be in contact with you soon to arrange shipping of your prize package. Thank you for entering the contest and for being a member of the Camping World President's Club. We appreciate the opportunity to provide you with top quality outdoor and RV accessories so that you may better enjoy the RV lifestyle. We extend our congratulations to you and hope you enjoy tailgating with your new Coleman outdoor accessories! "This isn't my first time"